BendPak's HD-Series alignment lifts are engineered to meet the strenuous demands of even your toughest professional lifting jobs. Designed into every HD-Series lift is a laundry list of key features as long as your arm to ensure that BendPak is the absolute best you can buy. Our competitors might say we overdo it, but we don’t include components for the sake of frills and flash. We design our lifts with the attributes we feel should come standard with every lift—the kind of lift we would want to (and do) own. Take the HD-14LSX for instance. This is the sturdy beast you want as the backbone of your shop; especially if you specialize in servicing larger, low ground clearance vehicles. 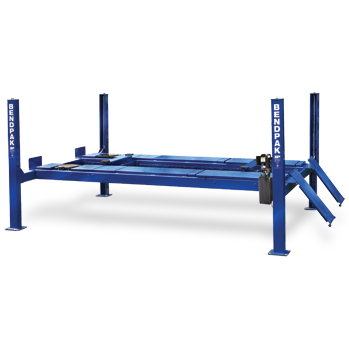 Our alignment system features front turn plates and rear slip plates built right into the runways. The wheels always respond to your adjustments with no resistance or hassle. We call it “free floating.” You’ll call it unbelievably easy. It’s just another way that you can bet on BendPak lifts for increased durability, safety and productivity. Spend less time worrying about what you’re working under and more time doing what you love. Our commercial-grade lifts are second to none and recognized the world-over as benchmarks of dependability and quality. Love the extended lifting and aligning power of the HD-14LSX, but need something a little different? Check out the standard HD-14LS and the limo-long HD-14LSXE. The HD-14LSX is equipped with multiple adjustable height locking positions for variable-height parking. A convenient push-button pneumatic safety lock control releases all four independent safety locks simultaneously. Each lift is supplied with 4 high-quality stainless steel lifting cables, rated at 14,400 lbs. each. The combined rating of these cables is more than 411% of the maximum lifting capacity of the entire lift! And we make sure it looks tidy too—all lifting cables are fully enclosed within the lift structure itself.